Track construction is currently underway along Florence Avenue between West Boulevard and Centinela Avenue, near Edward Vincent Jr. Park a.k.a “Centinela Park.” In the photos above, ballast rocks are being distributed to help stabilize the rails. The ballast helps reduce vibrations released from the tracks and prevents weeds from growing and obstructing the rails. The next phase of construction: bridge framing removal at Aviation/Century Station and tunneling expected to be completed by early April. 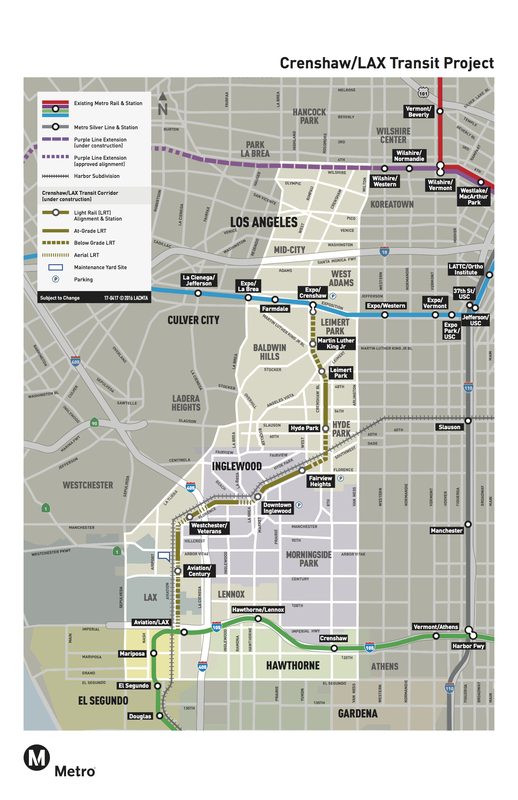 The 8.5-mile Crenshaw/LAX Line is a $2.058-billion light-rail line that will run between the Green Line and the Expo Line and have eight new stations to serve the Crenshaw, Inglewood and LAX communities. It is expected to open in late 2019. The final EIR projected a 2018 opening and this article now says late 2019. What are the reasons for the delay? Also, it seems like this project is pretty far along–any indication of whether an opening earlier than late 2019 is possible at this stage? I remember they also started putting in the Expo line tracks for phase 2 seemingly early, 2 1/2 years before the anticipated opening. There was all kinds of equipment installation and testing that took a while. I wonder if, on this line, they’re just getting certain segments done first so that they can shift a limited number of workers around to other segments. I’m also wondering if the delay in Metro’s rail car delivery played a factor in the timeline. Would they have had enough rolling stock to operate it, if it had been on schedule for 2018?